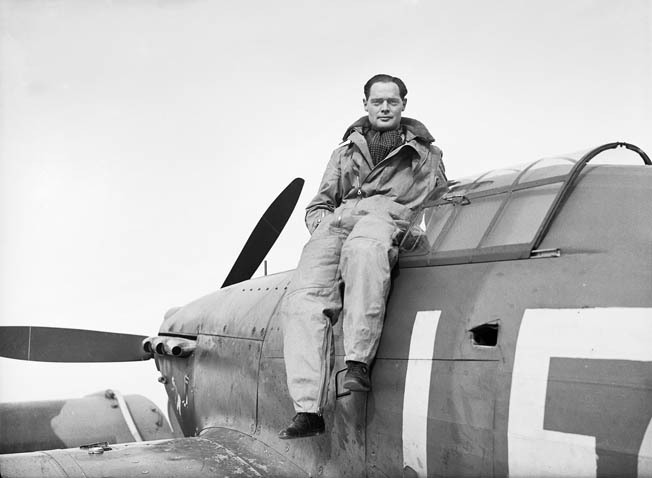 Douglas Bader was a formidable foe in the air and as a prisoner of the Germans even though he had no legs. Bombed almost daily for several months and in fear of an imminent German invasion, the British were hanging on by their fingernails when September 1940 came. With the fate of Western freedom in the balance, history’s first major air battle raged as Supermarine Spitfires and Hawker Hurricanes of Royal Air Force Fighter Command rose to challenge relentless formations of Luftwaffe bombers over southeastern England. Aerial supremacy was vital to the Germans, and the British had to be softened up before Nazi dictator Adolf Hitler could mount his postponed invasion, Operation Sea Lion. Otherwise, the English Channel assault was considered too risky. A September 14 directive from the impatient Führer gave Reichsmarshal Hermann Göring, commander of the Luftwaffe, until the 17th to batter the RAF into submission. So, as dawn clouds cleared and the sun rose early on Sunday, September 15, the powerful Luftwaffe prepared to launch its supreme attempt. The climactic day of the Battle of Britain unfolded quietly. “It was one of those days of autumn when the countryside is at its loveliest,” observed Air Vice Marshal Keith Park, the able commander of No. 11 Fighter Group. Royal Air Force patrols reported an empty, cloudless sky, and no enemy aircraft appeared until mid-morning, apart from reconnaissance flights. But 15 minutes later, at 11 am, Women’s Auxiliary Air Force plotters began to bustle about the 11 Group map tables. Ominous reports filtered in from coastal radar stations: 40-plus enemy planes assembling in the Dieppe area, then a force of 20-plus, and then another of 40-plus. It was not until 11:30 am that these formations began to move northward. The Luftwaffe was launching the assault without its usual feints and subsidiary attacks aimed at luring Fighter Command planes prematurely into the air. Air Marshal Park had been given 30 minutes to organize his squadrons. Fuel tanks were topped and magazines filled, and 17 RAF fighter squadrons were deployed by 11:30 am. They included one from No. 10 Group and five from Air Vice Marshal Trafford Leigh-Mallory’s No. 12 Group, based at Duxford, north of London. Heading southward toward the action, Leigh-Mallory’s three Hurricane and two Spitfire squadrons comprised a single “Big Wing” formation under the tactical command of Group Captain Douglas R.S. Bader. Staunchly advocated by Leigh-Mallory and the legless Bader, the Big Wing concept was based on tactics initiated by the famed Italian airman, General Italo Balbo. It called for large fighter formations to hit an approaching air fleet with maximum striking power, rather than with what Bader called “penny packets.” The tactic would trigger much controversy in Fighter Command. Before noon on that fateful Sunday, the first of the estimated 200 German planes—the largest bomber force yet dispatched—crossed the English coast at Dover. Dornier Do-17 and Do-215 bombers escorted by many Messerschmitt Me-109 fighters zigzagged over Kent and Sussex and headed for London. RAF fighters attacked, dogfight vapor trails skeined the blue skies, and burning planes plummeted and parachutes billowed down. The battle seethed toward London, and bombs fell all over the capital. Dogfights raged above London for 25 minutes, and by 3:15 that afternoon the German formations had been ripped apart with the loss of an estimated 60 planes. Still harassed by Spitfires and Hurricanes, enemy stragglers headed back across the English Channel to their bases along the French coast. Although few people realized it at the time, Fighter Command had decided the Battle of Britain. Two days later, Hitler postponed the invasion indefinitely. September 15 was thereafter commemorated as Battle of Britain Day. The RAF’s fierce opposition and the timely role of the 55 fighters of Leigh-Mallory and Bader’s Big Wing on September 15 squelched a German myth that Fighter Command was a beaten force that had to call on its “last 50 fighters.” The Luftwaffe suffered a blow to its morale from which it never recovered. After a few more heavy raids on London and other cities, the main daylight blitz quietly fizzled out. Group Captain Bader, a veteran of the air battles over Dunkirk before becoming an ace and inspirational fighter tactician, was a fearless maverick. He refused to let a severe disability keep him on the ground and out of uniform and emerged as the most famous RAF pilot of World War II. Douglas Robert Steuart Bader was born on Monday, February 21, 1910, in the fashionable St. John’s Wood district of London. He was the second son of Frederick R. Bader, a heavy-set civil engineer on furlough from India, and his tall, black-haired wife, Jessie. After their father was commissioned in the Royal Engineers and sent to France at the outbreak of World War I, Douglas followed his older brother, Derick, to the Colet Court (London) and Temple Grove (Eastbourne) preparatory schools. 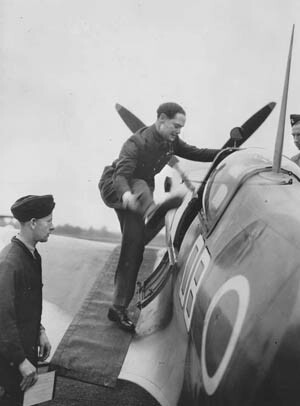 Squadron Commander Douglas Bader sits on the edge of the cockpit of his Hawker Hurricane fighter. Impulsive and lively, Douglas held his own in fistfights with bigger boys and excelled in rugby, gymnastics, cricket, running, soccer, and hockey. He and his brother learned archery, and a retired chief petty officer taught the younger boy to shoot. Douglas tried his utmost on the sports field, but, obstinate like his strong-willed mother, he was lazy in the classroom. He picked up Latin and Greek with ease but detested mathematics and other subjects. In 1922, a War Office telegram informed the family that Major Bader had died of head wounds in St.-Omer, France. Though not slackening his sports activities, Douglas then buckled down to serious studies and won a scholarship to St. Edward’s School at Oxford University. While there, the young man spoke with a visiting graduate who was now attending the Royal Air Force College at Cranwell in Lincolnshire and decided that flying might be fun. Douglas wrote to his uncle, Cyril Burge, who was personal assistant to Air Chief Marshal Sir Hugh Trenchard, visionary father of the RAF, and asked what his chances were of becoming an air cadet. After an RAF examination in London in the spring of 1928, Douglas was informed that he had finished fifth and won a cadetship to Cranwell. He was in high spirits and acquired a second-hand Douglas flat-twin motorcycle. In the second week of September 1928, he strapped two small suitcases to the pillion, kissed his doting mother goodbye, and roared off for Cranwell. Four miles from the college, a stray cow wandered across the road. Douglas swerved, and he and his machine somersaulted over the verge and a steep bank. Bruised and shaken, he started off again. Eight minutes later, he rode through the gates of Cranwell and into the Royal Air Force. At Cranwell, then just a collection of cavernous hangars, wooden huts, and two runways, Bader and the other cadets drilled in bowler hats before being issued uniforms and learned military discipline from caustic warrant officers. A few days later, on a sunny autumn afternoon, Bader was taken up by a flying officer for his first flight—in a flimsy Avro 504 biplane. The cadet was exhilarated. On the following day, Bader’s instructor let him take the control column, and in October, after 61/2 hours of dual instruction, he soloed. He flew and landed smoothly and proved to be a natural flier. Inspired after reading about Royal Flying Corps aces in World War I, Bader decided that he wanted to be a fighter pilot. Unlike most of his fellow cadets, the highspirited Bader shunned alcohol but nevertheless got into trouble for speeding on his motorcycle and flouting minor regulations. After being threatened with dismissal from Cranwell, he transformed. While still excelling in all sports, he strove to master mathematics and showed a flair for leadership. He scored high on the final examinations in June 1930, and his fitness report termed him “plucky, capable, headstrong.” His flying was rated “above average,” an RAF understatement. Pilot Officer Bader was posted to No. 23 Fighter Squadron based at Kenley, a large, grassy airfield in Surrey. He was proud and elated. He rode his motorcycle to London, traded it in for a tiny Austin Seven car, and drove south to Kenley one August morning in 1930. A daring airman and outstanding sportsman, Bader found himself being viewed as a heroic figure, although he drew the wrath of his superiors for too much aerial stunting. A flight commander chastised him for “showing off.” But the outspoken Bader enjoyed the attention of the press and adoring young women and rewarded himself by trading in his Austin Seven for an MG sports car. Replacing the obsolete Gamecocks, No. 23 Squadron was equipped in 1931 with Bristol Bulldogs, then the last word in fighters. The biplanes had a top speed of 176 miles per hour, but they were heavier, less maneuverable, and had a tendency to sink fast in the middle of a slow roll. One of the pilots was killed when he spun into the ground, and low aerobatics were strictly banned. The brash, sometimes arrogant Bader was unfazed, and his promising career almost came to an abrupt end because of overconfidence. On the frosty morning of Monday, December 14, 1931, he and two fellow pilots flew Bulldogs to Woodley Aerodrome near the Berkshire city of Reading. While sipping coffee in the clubhouse, Bader’s companions quizzed him about his aerobatics at Hendon and dared him to give a demonstration. Though reluctant, he took off. Hawker Hurricane fighters of Bader’s 242 Squadron are shown in formation above the coast of England. At the time Bader was shot down in 1941, he was the leading ace of the Royal Air Force in World War II. He banked steeply, turned back, and started a low run across the airfield. But the Bulldog rolled to the right and started to drop rapidly with its wings vertical. Bader tried frantically to gain control, but the left wingtip, cowling, and propeller hit the grass. The plane cartwheeled and crumpled in a cloud of flying dirt. Strapped in the cockpit, Bader felt nothing but heard only a terrible noise. Bloodied and semiconscious, the young man was pried from the crushed cockpit with the aid of a hacksaw, laid on a stretcher, and offered a glass of brandy. “No, thanks very much,” said Bader casually. “I don’t drink.” Then he was rushed in an ambulance to the Royal Berkshire Hospital in Reading. Within a minute of his arrival, he was on an operating room table. Bader endured several operations and great pain as his shattered legs—first the right and then the left—were amputated. He was fitted with stumps, and learned to hobble around with crutches. He was determined to try and live a normal life and stay in the Royal Air Force because it was his “home.” Bader learned to drive a car without his legs, and during an outing with his mother from the RAF Hospital at Uxbridge, they stopped at a roadside café in Bagshot, Surrey. A comely waitress named Thelma served them tea and later became Bader’s devoted wife. At Roehampton, a London hospital specializing in artificial limbs, Bader was fitted with metal legs. He fell many times but learned to stump around on them. He refused to use a cane. He was ecstatic at being able to stand, and nothing held him back. After passing a disabled driver’s test, he took his little MG back on the road. With his “tin legs,” he played cricket and golf, went dancing, and returned to the air. Joyfully, he flew an Avro 504 of 601 Auxiliary Squadron from its base at Lympne, Kent, to Kenley and back again. But, inevitably, the Air Ministry decided that Bader should be reverted to the retired list because of his disability. Devastated, he went to work in the aviation section of Asiatic Petroleum Co., based in London. It was a dull job, but he kept his spirits up by driving fast and mastering golf. One morning in 1935, he was heartened by a Daily Telegraph story announcing that the RAF was to be expanded. He began pressuring the Air Ministry for a refresher flying course so that he could be ready when war came. In October 1939, a month after its outbreak, a telegram summoned him to the Central Flying School at Upavon, Wiltshire. Bader eagerly retrained in a number of aircraft types, including the North American Harvard trainer, Avro Tutor, two-seater Fairey Battle, and Miles Master before going on to Hurricanes and Spitfires. He had great admiration for the Hurricane, but said of the latter, “Here was the aeroplane par excellence … in fact, the aeroplane of one’s dreams.” He was posted in February 1940 to No. 19 Squadron at Duxford, where he flew Spitfires, and then to Squadron Leader Tubby Mermagen’s No. 222 Squadron, also based at Duxford, as a flight commander. Patrols and sorties by Fighter Command’s frontline Hurricanes and Spitfires increased dramatically as the British Expeditionary Force (BEF) was pushed back to Dunkirk in late May and early June. Over the fire-swept beaches during the BEF’s historic deliverance by the Royal Navy and a motley fleet of “little ships,” Bader scored his first victory by downing an Me-109. He was exultant. He took part in the last patrol over Dunkirk on June 4, and then, exhausted, slept for almost 24 hours. The following month, Bader was given command of No. 242 Squadron, a mainly Canadian unit that had been mauled in the Battle of France. Morale was low, but Bader’s inspired leadership restored the squadron’s fighting spirit. Gregarious, cheerful, and effectively leading five squadrons as a wing commander in 1940, he imparted freely his knowledge and the dogfighting philosophy laid down in World War I: “He who has the sun creates surprise. He who has the height controls the battle. He who gets in close shoots them down.” He advised his Canadian pilots to attack from below and astern. In March 1941, the legless warrior was appointed wing leader at Tangmere in West Sussex, where he quickly made his presence felt and improved aerial tactics. Though dogmatic and unwilling to accept contradiction, Bader had a cheery, irreverent relationship with his pilots as they flew many defensive patrols and “rhubarb” sorties over Nazi-occupied France. The Tangmere Wing was a happy family. The leader inspired confidence by trivializing risks and dubbed the wing the “Green Line Bus.” Its motto was “Return Tickets Only.” Bader’s initials, DB, painted on the side of his Spitfire, were transmuted to “Dogsbody,” and he adopted this as his call sign in the air. September 1945. After being liberated from a German prison, Bader returned to duty and led a flight of Spitfires from North Weald Airfield in a flyover of London commemorating the fifth anniversary of the Battle of Britain. But Bader’s luck ran out on August 9, 1941, while he was leading the Tangmere Wing on a sortie over northern France. After being shot down or reportedly rammed by an Me-109, he was captured by three German soldiers and taken to a hospital in St.-Omer, where, ironically, his father had died after being wounded in 1917. The famed wing commander, who injured his ribs and lost one of his artificial legs when he bailed out, was well treated. While in the hospital, he was invited to visit Lt. Col. Adolf Galland, commander of the nearby Luftwaffe airfield at Wissant. Picked up in a Horch staff car, Bader was feted at a tea party by the amiable German fighter leader and his pilots, given a can of captured English tobacco, and allowed to sit in an Me-109 cockpit. Bader responded eagerly, “All right, let’s have a go!” Galland laughed off the suggestion and said that he was off duty. Bader was unaware at the time that a German officer was covering him with a pistol. Shortly afterward, Galland chivalrously arranged for Bader’s spare tin leg to be air dropped by the RAF. With the aid of a French nurse, Bader escaped from the hospital by lowering himself from a window with knotted bed sheets. He hobbled to a peasant’s house but was betrayed by another nurse and recaptured. Transferred to prison camps, he made several more escape attempts before his captors took away his legs at night. Growing to loathe the Germans, he regularly defied and insulted them. Shipped eventually to the grim Colditz Castle in Saxony, in August 1943, as an incorrigible escape artist, he languished there until liberating U.S. troops arrived on April 16, 1945. The legless ace had been in captivity for three years and eight months. After being flown home in a twin-engine Avro Anson transport, he was joyfully reunited with his beloved Thelma. On September 15, 1945, henceforth celebrated as Battle of Britain Day, Bader wound a blue polka dot scarf around his neck, climbed into the cockpit of his “Dogsbody” Spitfire, and led 300 RAF fighters and bombers in a thunderous victory fly-by over London. His decorations included the Distinguished Service Order with bar, the Distinguished Flying Cross with bar, and Commander of the British Empire. He was later knighted and named a fellow of the Royal Aeronautical Society. The RAF hero continued to fly regularly after the war, preferring the Percival Proctor, Miles Gemini, and Beechcraft Bonanza aircraft. He eventually logged a total of 5,744 hours of flying time. Bader devoted much of his time to counseling and encouraging fellow amputees, wounded veterans, and sometimes handicapped children. He became a tireless champion of the disabled in Britain and abroad and was knighted in 1976 for his work. The flier’s wife, Thelma, died of throat cancer in January 1971, and he married Joan Murray in January 1973. Bader continued to lead an active life. Besides walking and playing golf, tennis, and squash, he flew regularly until grounded in 1980 because of a heart condition. The legless hero attended many RAF reunions, and his last was an emotional banquet honoring Air Chief Marshal Sir Arthur Harris, the wartime leader of Bomber Command, in London’s Guildhall on Saturday, September 4, 1982. Bader died of a heart attack while driving home with his second wife, Joan. He was 72. On Thursday, August 9, 2001, slender, white-haired Lady Bader unveiled a bronze statue of her famous husband at Westhampnett, West Sussex, near the Tangmere RAF field from which he took off on his last mission on August 9, 1941. Tags Adolf Galland, Adolf Hitler, Allies, Axis, Battle of Britain, Battle of France, British Expeditionary Force, british military history, Distinguished Flying Cross, Douglas R.S. Bader, Dunkirk, English Channel, Fighter Ace, Hawker Hurricane, Hermann Göring, Italo Balbo, luftwaffe, Messerschmitt Me-109, Operation Sea Lion, RADAR, Royal Air Force, Supermarine Spitfire, Winston Churchill, Women’s Auxiliary Air Force.